This cable is designed to connect your PC or Laptop to a High Definition TV. As long as your laptop/PC and TV have a 15pin socket (normally blue D shape connector) you can use your TV as your screen. 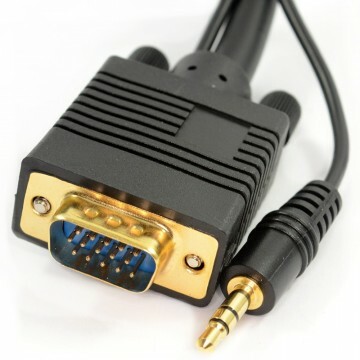 This cable is capable of High Definition (resolutions above 1080p) made of the highest quality copper and gold plated connectors. Unlike most VGA cables this also carries sound (3.5mm jack to 3.5mm jack). All laptops and PC s have a jack sound output (e.g. speaker/headphone out) and most TV s have a jack input associated with the VGA socket (Some TV s may need a jack socket to 2 phono adapter cable to convert the jack to red and white phonos). Perfect for all tv s with a 15 pin socket including Samsung LCD s and Plasmas Sony Panasonic Philips Toshiba Sharp JVC LG Pioneer and many more. All 15 pins connected. 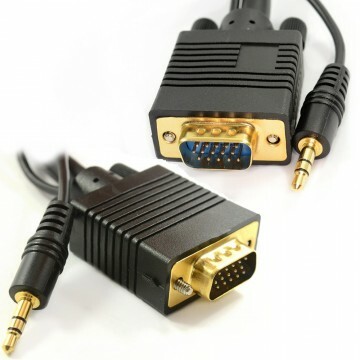 Description High quality gold 15 pin SVGA cable with built in 3.5mm stereo jack cable. This item is perfect for connecting your computer/laptop to your television to produce the perfect quality picture and sound! NB Please make sure that your audio jack socket is within 40cm of your vga socket otherwise a jack extension cable will be needed. 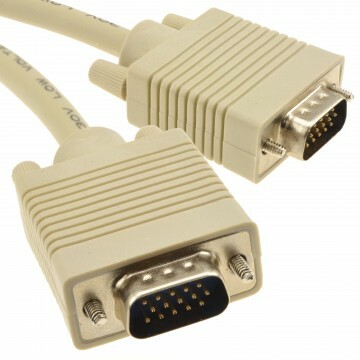 VGA + AUDIO LEAD 2M .